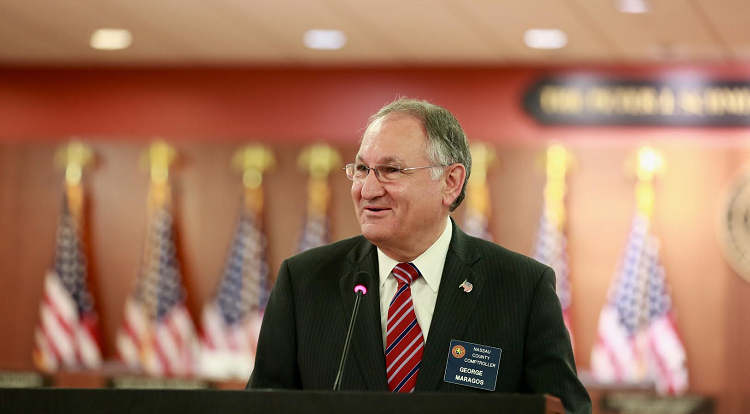 On Tuesday, November 15, Nassau County Comptroller George Maragos held the Comptroller’s Business Roundtable for Minority, Women, and Veteran Business Owners. 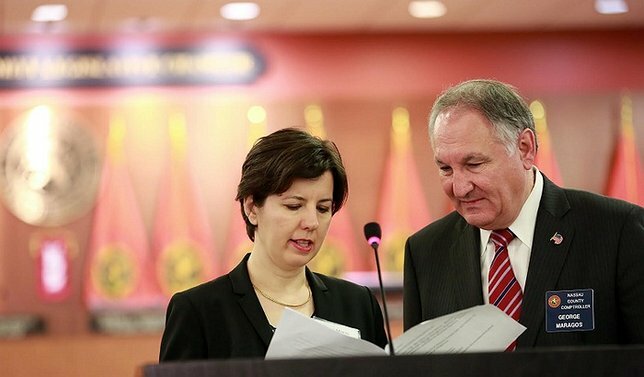 Eleni Manis (right) with Comptroller George Maragos at MWVBE Business Roundtable. Photo by: Office of the Nassau County Comptroller. Mineola, NY - November 18, 2016 - On Tuesday, November 15, .Nassau County Comptroller George Maragos held the Comptroller’s Business Roundtable for Minority, Women, and Veteran Business Owners, an event to boost the participation of minority, women, and veteran-owned businesses in Nassau County contracting. The Business Roundtable was held at the Theodore Roosevelt Executive & Legislative Building at 1550 Franklin Avenue, Mineola. Over 250 local business owners and community members attended this lively event which included standing-room only panel discussions with government buyers sharing their purchasing needs, panels on the certification and procurement process for small business owners, and a panel of Nassau County prime contractors discussing upcoming subcontracting opportunities. The Roundtable speakers and exhibitors included key players from federal, NYS, NYC, and Nassau County government agencies, as well as a large number of Nassau County’s biggest prime contractors, and representatives of MWVBE business organizations. Pictured: Comptroller George Maragos at MWBVE Business Roundtable event. Photo courtesy of Office of the Nassau County Comptroller. The Comptroller’s Roundtable was organized by Eleni Manis, Senior Research Analyst in the Comptroller’s Office, in collaboration with the Comptroller’s staff and in partnership with over 40 government agencies, business organizations, and community groups. The Comptroller’s Business Roundtable was catered by Churrasqueira Bairrada Restaurant of Mineola, Mama’s Soup of Mineola, Stop & Shop of Hempstead, and King’s Market, Key Food, and Starbucks of Garden City. Business Insurance shelters the business or company from colliding! Win with Your Hidden Assets - Build Your Business with the Treasure at your Finger Tips! Subject: LongIsland.com - Your Name sent you Article details of "Maragos: Over 400 People Attend Comptroller's MWVBE Business Roundtable"